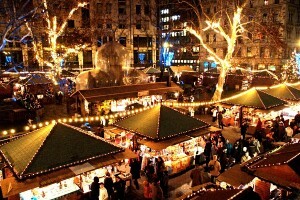 The Budapest Christmas Market is amongst the best ten Christmas markets in Europe. The spectacular fair takes place every year from the end of November until the end of December in the heart of the city on Vörösmarty Square. A Christmas wonderland is waiting for you in the heart of the city every day from 10 am to 8 pm, where beside a row of well-known attractions – such as professionally selected traditional folk and innovative artisan crafts, Christmas delicacies, Advent Calendar in the windows of the famous Gerbaud Confectionary, entertaining cultural programs, Christmas crafts playhouse for kids and Santa’s personal visit – the organizer, team of Budapest Tourism, is preparing with some surprises as well. You can peek into the workrooms of craftsmen and cooks, taste a wide range of spicy winter drinks, eat and buy traditional Hungarian Christmas foods, discover the central district of Budapest through fairy tales tour or participate at Christmas flash mob actions. The Peace Light, brought from the Church of the Nativity in Betlehem, lights up on the square for the first time this year to convey the message of peace and draw attention to the importance of charity, for which numerous pavilions provide opportunity at the fair.